77 left in stock, Hurry! 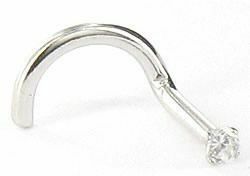 18g 14kt White Gold 1.5mm CZ Jewel Nose Screw Solid 14KT Gold Nose Screw with a 1.5mm CZ Gem 18g with inner diameter of 6mm The Gem is set on this so it actually lays flat on your nose. Its a martini glass shape. It won't stick up and out like most others on the market.